On spring, as I went about cleaning up the dishes after breakfast, out of the corner of my eye I saw a blur fly past the patio door and make a sharp veer to the left. I was grateful that the bird hadn’t been fooled into flying into the window’s reflection. I was keen to locate it in my backyard and thrilled when the bird turned out to be a Hermit Thrush (Catharus guttatus). 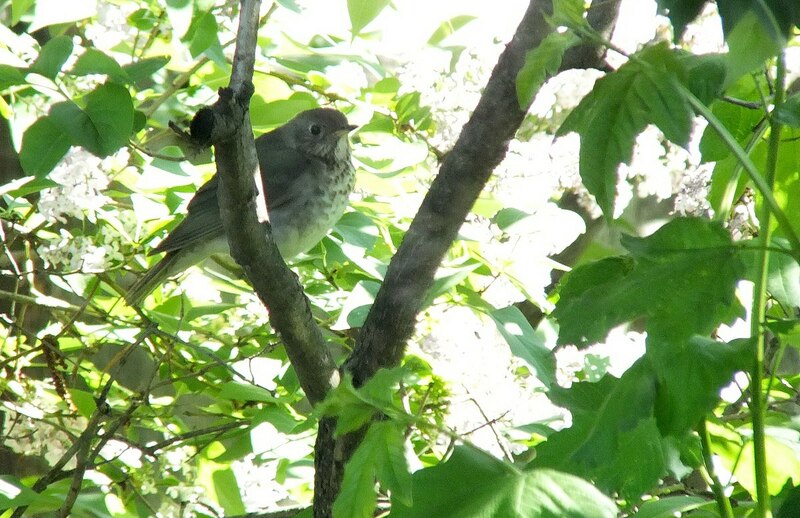 When first I espied the Hermit Thrush, I thought it was a fledgling American Robin, being of similar colouring, but the olive-brown plumage and whitish eye-ring is what made it possible to distinguish between those two species. I was extremely excited to see a Hermit Thrush. These birds are very special to me. Many years ago, when Bob and I were camping with one of our sons at Lake St. Peter Provincial Park, we were serenaded every morning by a number of these birds that lived in the coniferous forest there. Rousing us from our slumbers each day were the musical flutey tunes of these plain little songbirds. 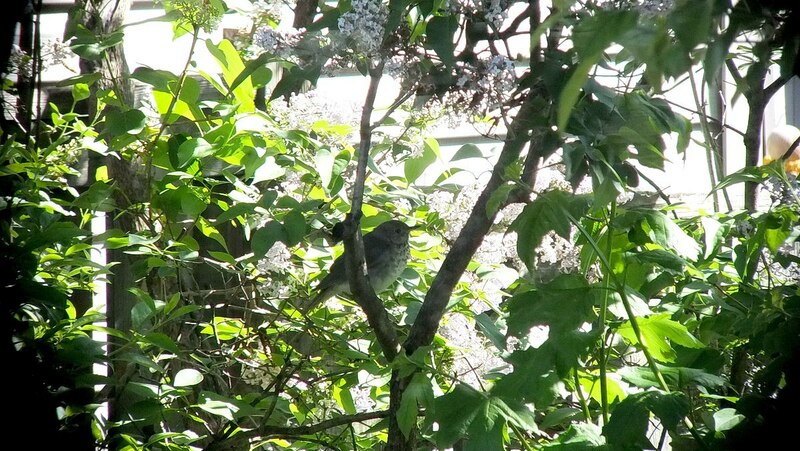 As I watched and waited, the Hermit Thrush enjoyed the shade in amongst the lilac branches, not seeming to mind all the attention it was garnering from Bob and me. 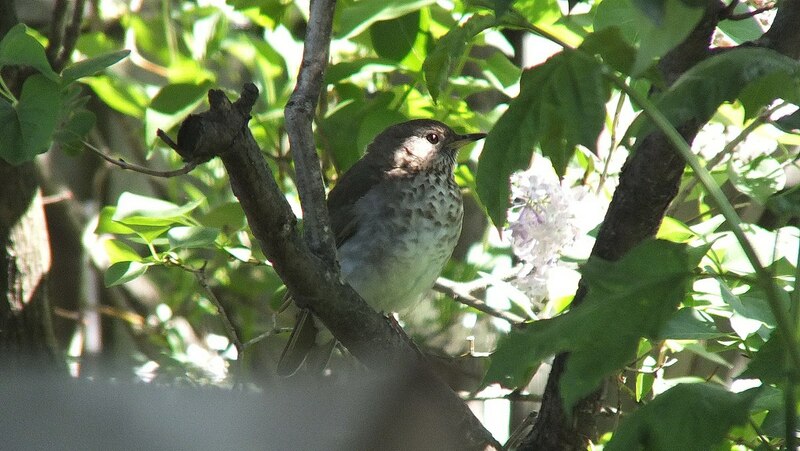 As you will see in Bob’s video, the Hermit Thrush just calmly sat hidden away from predators. It was rather surprising to see a Hermit Thrush in Toronto at this time of the year as I think of them more as an inhabitant of northern forests, but I was more than pleased to welcome it to my garden. I fervently hoped that it would break into song. Hermit Thrushes are believed to be the finest singers of North American birds. Their ethereal music, with clear bell-like tones, is especially effective in the quiet of a northern woods on a summer evening. 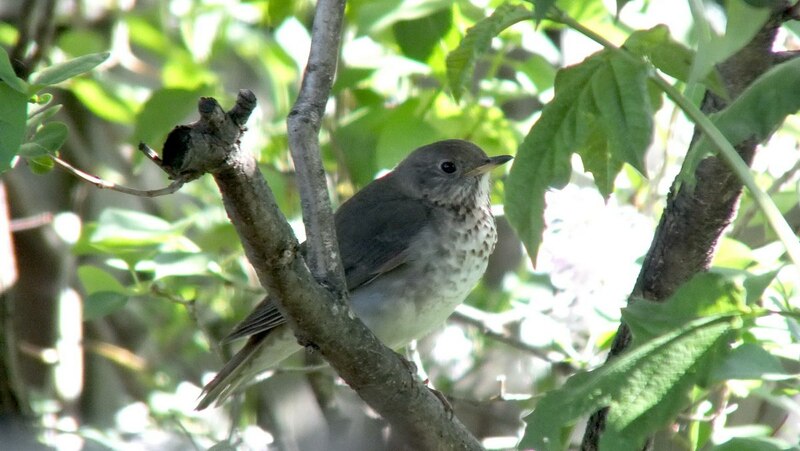 If you would like to hear the song of a Hermit Thrush, then have a listen to this YouTube video. In the world of birds, a Hermit Thrush is considered to be closely related to a Mexican Russet Nightingale-thrush. Perhaps that is why it sings such a melodic tune. 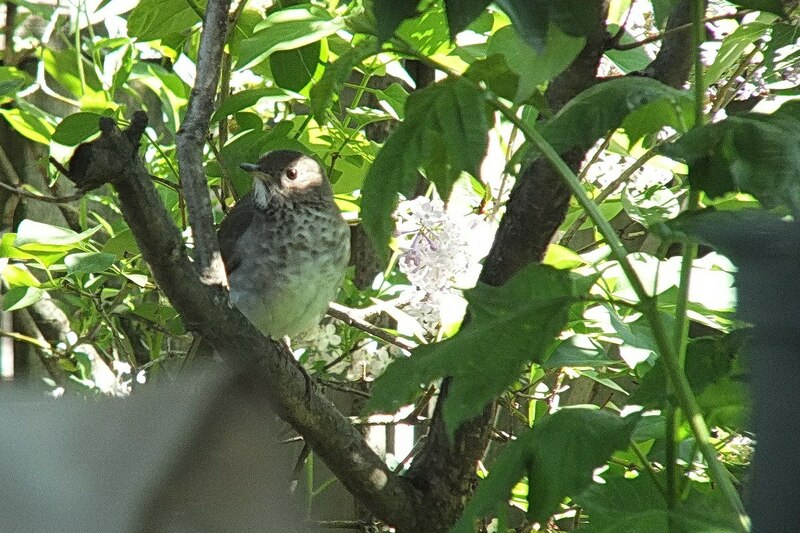 In any case, the thrush in my backyard remained in the lilac tree for close to 30 minutes before taking flight. I wonder if I’ll ever be graced by its presence again. I sure hope so. 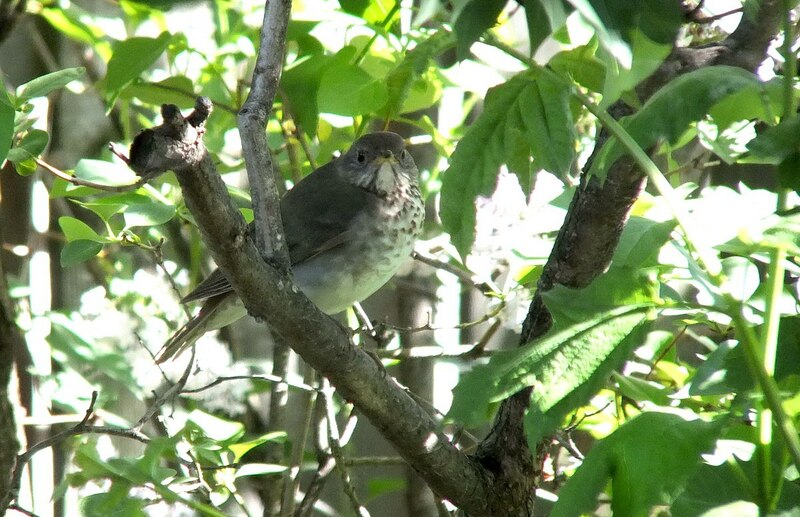 Your bird is actually a Gray-cheeked Thrush. The greyish flanks on the side of the bird plus the cold tones on the face indicate it as such. 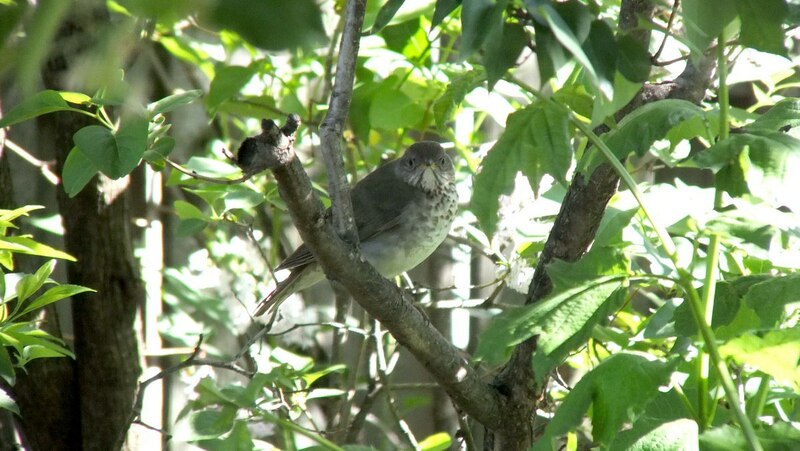 It is a more difficult bird to come across on spring migration than the Hermit Thrush, and especially in your yard. Consider yourselves fortunate! Thanks, Kellie. I believe you are right. I had no idea. We have had Hermit Thrushes on our property over the years, so we thought this was another one, perhaps an immature bird or in spring plumage. How wonderful to hear the song of the Hermit Thrush! Absolutley delightful! Hi Janine. Thanks for your comment. I love to hear the song of the Hermit Thrush when out in the woods. One time, Bob and I rode our bikes in past The Last House at Oxtongue, and, way back in along that road, we heard a Hermit Thrush where a lot of pine trees grow. Their flute-like melody resonates through the air and always transports me back to the first time we heard them at Lake St. Peter.